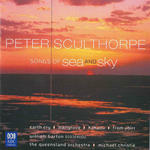 Dream tracks (1992) for violin, clarinet and piano Peter Sculthorpe 13 mins, 49 sec. From Nourlangie (1994) for soprano, viola, cello and piano Peter Sculthorpe 4 mins, 45 sec. Night song (1995) for violin, cello and piano Peter Sculthorpe 6 mins, 38 sec. Sonata for viola and percussion (1960) for percussion and viola duo Peter Sculthorpe 10 min, 33 sec. Tabuh tabuhan (1968) for wind quintet Peter Sculthorpe 25 mins, 55 sec. Contents note: Songs of sea and sky -- Tabuh tabuhan: for wind quintet and percussion -- Dream tracks: for violin, clarinet and piano -- Sonata for viola and percussion -- Night song: for violin, cello and piano -- From Nourlangie: for soprano, viola, cello and piano. 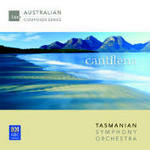 CD: Cantilena / Tasmanian Symphony Orchestra.